Are you feeling weak, nervous or irritable? Are you experiencing frequent stomach pain and irritation or nausea? Are you unable to find the source of your symptoms? These symptoms may be the result of excess heavy metals in the body. 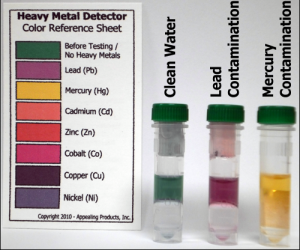 ChemSee’s detection kits for Heavy Metals are simple and quick tests to identify if your body has high levels of heavy metals. In addition, a person can test his or her foods, water, drinks and other sources of potential heavy metal contamination to see if it is attributing to these levels. Our GHM-01 Detector for Common Heavy Metals rapidly and easily detect and identify heavy metals in a wide-range of samples. This detector is capable of identifying Lead, Mercury, Cadmium, Zinc, Cobalt, Iron, Copper or Nickel. The AJ-05 Arsenic Detector was designed to detect Arsenic as low as 1 part per million (1 mg/L) in nearly any sample including Food, Liquids, Bodily Fluids (Urine/Saliva) or Stomach Contents in less than 90 seconds. 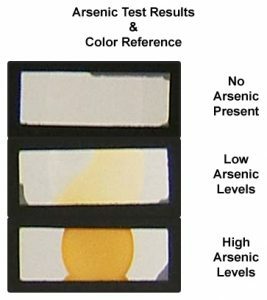 This simple-to-use detector is capable of quickly telling a person if a sample has Arsenic in it which may harm another person. Detectors for use at home to detect trace amounts of Arsenic in various samples including Water, Juices, Wine, Foods, Urine, Saliva and others. The AJLOW-01 Arsenic Detectors are capable of detecting as low as 1 part per billion of arsenic in water (0.001 mg/L). 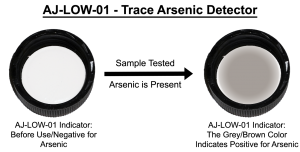 Chemsee now offers combination kits for detection of all Heavy Metals including Arsenic, denoted the THM(Total Heavy Metal) series. This kit comes in two variants THM-LOW-01 and THM-01. Both kits come with a GHM-01 General Heavy Metal Detector, but differ with which Arsenic Detector comes with it. More Information regarding Heavy Metal Toxicity, Common Symptoms, Ways to Avoid Heavy Metals and Exposure Routes are included in the sections below. Heavy metals, (HM), are metals which have a significantly higher density than water. Traces of many HM are essential for proper functioning of the body. Unfortunately, the incorporation of excess HM in the body results in toxic effects. Therefore, exposure of the body to excess HM and their incorporation should be avoided. Most of the foods and fluids that we drink contain small traces of HM but in general, these traces are not harmful. However, once the HM concentration exceeds certain levels, steps should be taken to stop the exposure and, in some cases, decontaminate or cleanse the body. There are over 30 HM but approximately ten of them are important in terms of exposure and health effects. Table 1 below lists the ten most important HM and their main paths of exposure. Table 1 describes the main health effects of the various heavy metals. Note that many products that are used daily by millions of people are made or have component heavy metals. Iron Fe All Systems (Excessive Doses Only) Hemochromatosis (Fatigue, Weakness, Weight Loss) Hemochromatosis (Arthritis, Dyspnea) Traces required for protein function in most living organisms. Nickel Ni Skin Minor Irritation in Sensitive Individuals Cancer (At High Chronic Exposure Doses) Required for function of several proteins, including Urease. Zinc Zn Gastrointestinal Tract (Excessive Doses Only) Nausea, Vomiting, Skin Irritation Anemia and Decreased Good Cholesterol, Infertility Functions in a wide variety of biological roles, including proteins. It is difficult to diagnose if any specific symptoms observed are the result of excessive exposure to heavy metals, (HM). The physiological symptoms of exposure, even to high doses of HM, are often similar to symptoms observed as a result of numerous illnesses and diseases. Therefore, even when the symptoms are consistent with HM toxicity, all illnesses that result in similar symptoms should be considered together with the possibility of HM poisoning. It should also be noted that HM can exacerbate existing illnesses. Moreover, certain groups of people such as pregnant woman, in particular in the very early stages of pregnancy, people with kidney or liver illnesses, very young babies or older people may suffer greater harm than oter groups. To reduce the cost of determining if the observed ill-effects are the result of exposure to excess doses of HM, we recommend performing first LOW-COST screening tests according to the following step-by step sequence. Model THM-01 which includes one of each GHM-01 and GAS-01. Note 1: If HM are detected in the urine or tap water sample, it is a clear sign of HM poisoning. Before getting too alarmed, REPEAT THE TESTS to confirm the results. STOP potential exposure to the HM, e.g. by using an alternative source of drinking or cooking water. Find the SOURCE of the HM and eliminate it. To this end, you may need to look for old paint in your house, which may contain lead, cadmium or chromium, old water pipes, spilled mercury, as well as examine foods which you consume regularly. Many times one needs to seek the advice of an industrial hygienist. Exposure may be occurring at work, home, or possibly from contaminated air, etc. III. If HM, and especially arsenic and thallium, are found in the urine and NOT in the drinking water, do not rule out the possibility of intentional poisoning. Note 3: If HM or arsenic are NOT found in the water or in the urine, there may still be excess exposure to HM or arsenic and it may still be a case of HM or arsenic poisoning. Note 4: Since exposure to HM can also be via skin contact or breathing dusts which contain HM, such routs are not common but may not be ruled out in advance. If no HM or arsenic are found in the urine or the drinking water, you may want to have your blood tested for HM. Since this set of tests is very expensive, you may want to first ensure that the symptoms you are observing are NOT due to other illnesses.